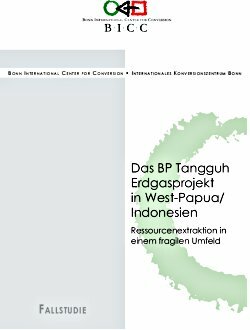 The BP Tangguh gas project in the Indonesian province of (West) Papua is the currently largest development project in Indonesia. Situated in Bintuni Bay in the west of New Guinea, BP intends to extract natural gas from offshore gas fields, liquefy it on land and export it to customers such as China and the United States. Apart from the police and the military, local state institutions are weak. The region has to be considered as underdeveloped—even for Indonesian standards. The Tangguh project will lead to major changes in the ecological, social, political and cultural circumstances in the region. These changes can induce conflicts and their escalation, especially since the project is situated in yet another political environment, which is characterized by conflict between the Indonesian central government and its security forces on the one hand and a Papuan secession movement on the other, and by complex competition between various sectors of the Papuan–Indonesian political elite.